One of the primary challenges when sketchnoting is deciding which ideas are worth putting onto the page. The goal isn’t to capture everything. You’re not transcribing word for word – that’s been shown to be a less effective approach to note-taking. So what do you capture? 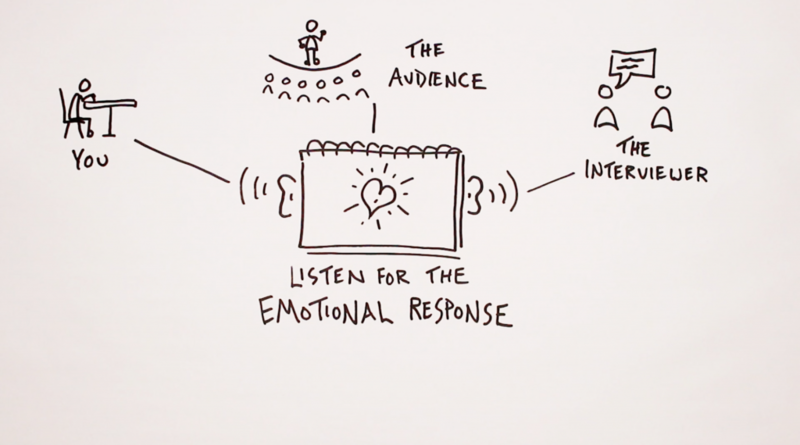 Here’s one way to filter the ideas that are coming in: listen for the emotional response. Now when I say listen, I mean that it two ways. The first is to listen to your own reaction. 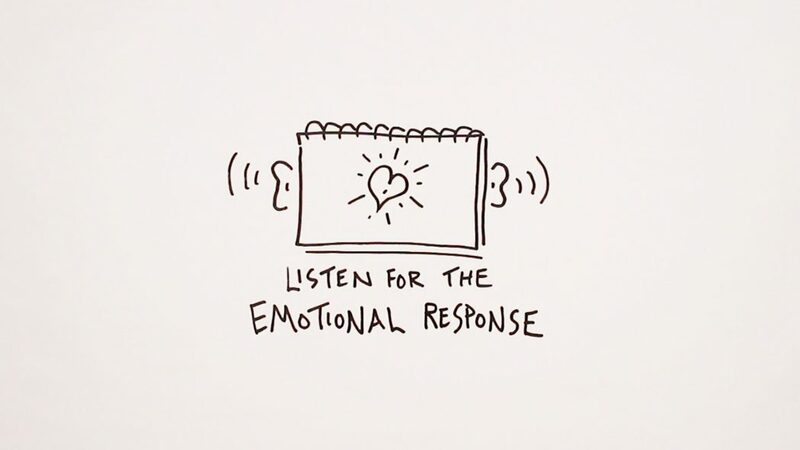 Pay attention to the way that you react emotionally to the ideas you’re hearing. The second is to literally listen to how the crowd reacts to a speaker or how an interviewer reacts to the person they’re interviewing. The reason that I think this is a potentially useful filter is because if there’s an emotional response, that’s a sign that something interesting is going on, and it’s worth exploring what precisely that interesting thing is and why it struck a chord. When I was taking sketchnotes of a podcast conversation about language learning, there was a moment when the guest spoke with an inflection in their voice and that phrase got a laugh from the interviewer. That one quote about the love of words ended up connecting to the two ideas that I found to be the most interesting from that conversation – that in language learning emotional engagement trumps best practices and that it really boils down to getting past the 2k word mark. 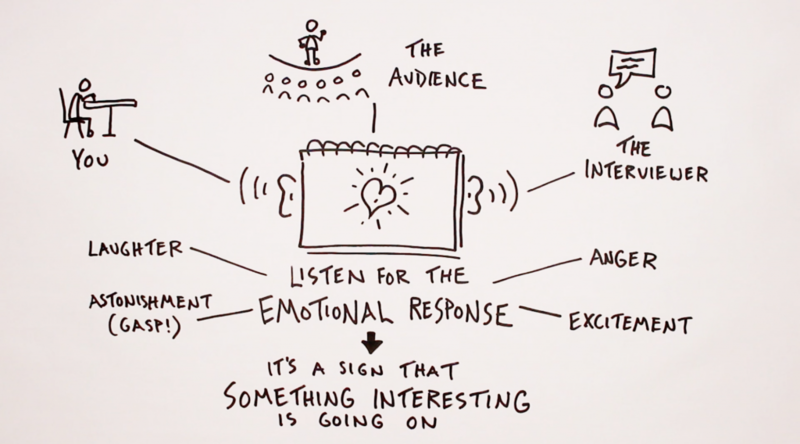 What that suggests to me is that you can use the source of the emotional reaction as a core component of your sketchnotes because it’s likely that it will connect to other important ideas in a talk or in a conversation. That emotional tie-in already makes for a stronger connection in your brain, so when you add to it some visual hooks as well, you’re creating multiple pathways to get back to that information in the future. So keep this approach in mind yourself the next time you’re sketchnoting. Listen for laughter or gasps in the audience. Pay attention to when you feel anger or excitement about something being said. And then use the source of that emotional response as a core component within your notes. Good luck experimenting with this idea yourself! 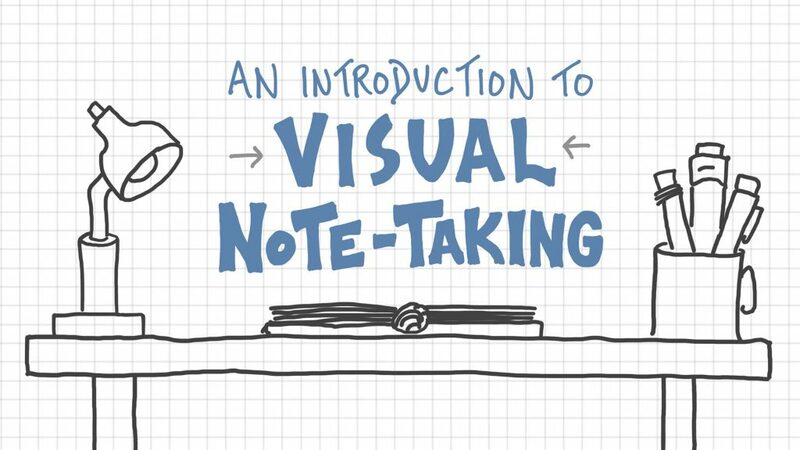 If you’d like to hear a bunch of other ideas about how you can build and use your sketchnoting skills, check out our course An Introduction To Visual Note-Taking – that will give you a solid foundation to work from. And if you’re interested in applying your sketchnoting skills to the task of language learning, check out our new course Learn a New Language with Sketchnotes. As always, thanks for watching and reading, and I’ll see you again soon.